We are smack dab in the middle of summer, and camping season is in full swing. While smores, campfires, and chilling out with friends and family are a blast, figuring out what you’re supposed to wear while in the woods all week can be challenging. The weather can be unpredictable and you can only pack so much. 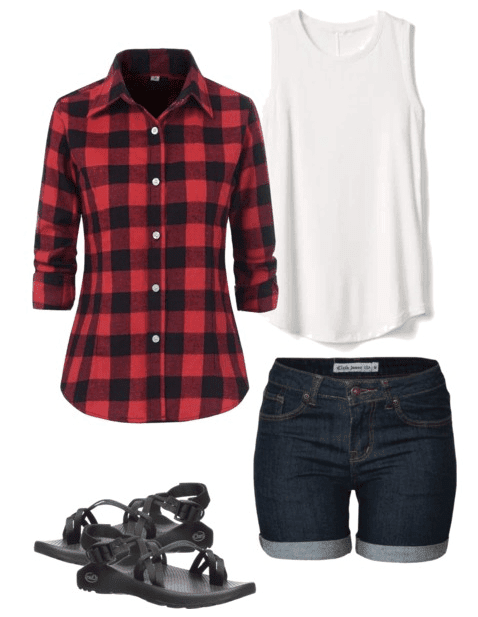 But have no fear; here are 5 days of outfits for camping. 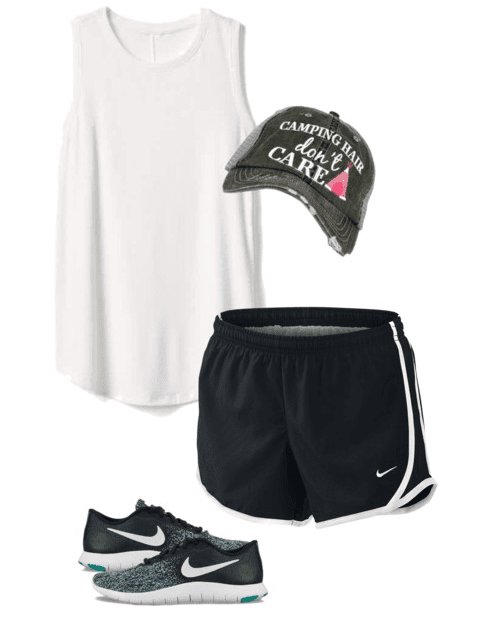 Wear this simple outfit for the first day while you are setting up camp so you won’t overheat, and so you won’t have to mess with your hair too much. Just pull it up into a low bun and stick a baseball cap on. Also, be sure your shorts and tank top are loose so you won’t be uncomfortable or have any trouble moving around. 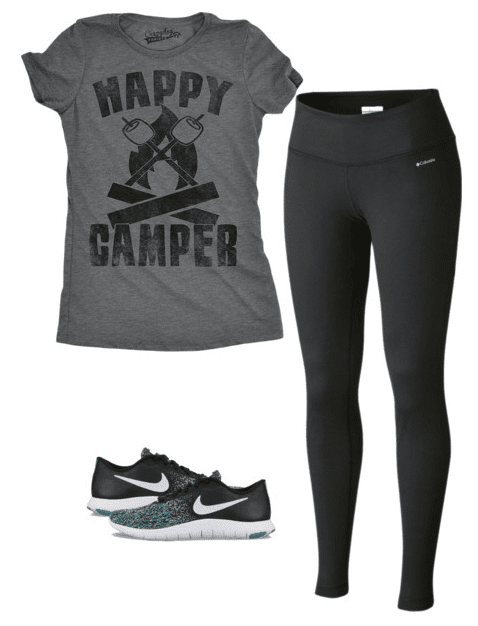 Save this outfit for an active day, like a long hike or rock climbing. Choose a pair of breathable, soft leggings, a loose tee, and shoes that have good support so your feet don’t ache by the end of the day. Also: bring a sports bra if you have one for extra comfort. 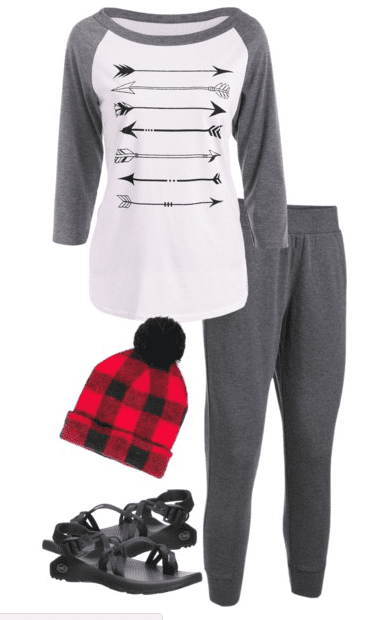 Save this outfit for a chill day around the campsite. It’s simple, functional, can be worn at pretty much any time, and includes an extra layer in case it gets a bit chilly outside. Be sure to pack a few t-shirts and pairs of shorts, since these are basic pieces and will be worn a lot throughout the week. 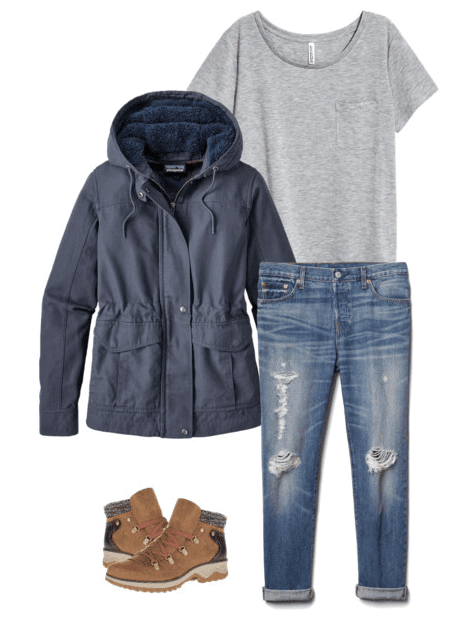 This outfit is good for just sitting around the fire and roasting some marshmallows, or when you are leaving the campsite and want to sleep in the car on the way home. The sweatpants are also perfect for nighttime, but bring some sleep shorts in case it’s hot. Stick to the basics and with clothes you don’t mind getting dirty. Don’t pack a pair of fancy shoes (obviously) or a blouse for camping. It will either get messed up or not worn at all. Be prepared, but don’t overpack. Pack a few of what you think you’ll wear the most (ex. T-shirts, shorts, underwear) and only one of each thing you won’t wear more than a couple times (ex. Jeans, shoes). Most of the outfits above can mix and match. When you’re camping, you tend to wear things multiple times. Pair the flannel with the sweat pants and tee. Wear the jacket over the leggings outfits. And the beanie goes with everything. Take care of your skin while camping. Find some face wipes and a moisturizer to take with you so your skin doesn’t suffer while camping. Love these ideas! I always end up feeling really scruffy when we go camping. I lovelovelove that “Camping Hair, Don’t Care” hat! SOOO cute!!! Thanks Kat! And same here. I HATE packing!